Some tastes are so familiar that just hearing their name brings their flavor to mind. Like True Blueberry, whose simple, fruity flavor comes from the wild blueberries we chose for this blend. They are very high in antioxidants and have overtones of purple grapes, providing a deeper berry flavor than their farmed cousins. Try it on ice! 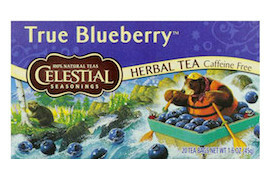 Ingredients: Hibiscus, rosehips, orange peel, natural blueberry flavor with other natural flavors, blackberry leaves, wild blueberries and blueberry leaves.